Good chocolate is expensive. Or not? I do think that the best chocolate might not necessarily be the priciest one. Many people might beg to differ but I stand by my statement. You see, sometimes we’re so blinded by brand that we fail to recognise the underdogs. Perhaps it’s just my inclination to always support the underdog brands or my innate allergic reaction to conformity. When I try something, I don’t judge it based on the brand – I’m fair. That doesn’t mean I don’t like well-known brands such as Valrhona, Lindt or Green & Black’s. Their chocolate rocks but I do fancy experimenting with other lesser-known brands. Seriously, I conclude that one can find good chocolate in the most unlikely places. And I’m going to talk about it in this post since the theme for Sugar High Friday #27 is Chocolate by Brand. Hosted by David ‘The Chocolate Guy’ Lebovitz, I was really excited when I found out about the theme. Thanks David! Something mysterious lies within and it’s 52% dark. I suppose it’s just me and my love affair with the dark. 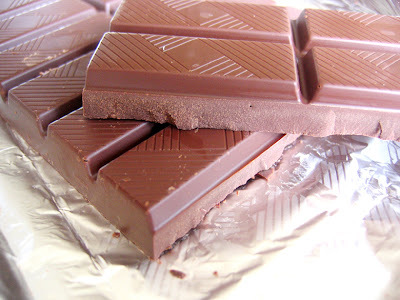 Dark chocolate soothes me, it heightens my senses and man, it’s too good to be replaced with anything else. There’s nothing like a good bar of dark chocolate. 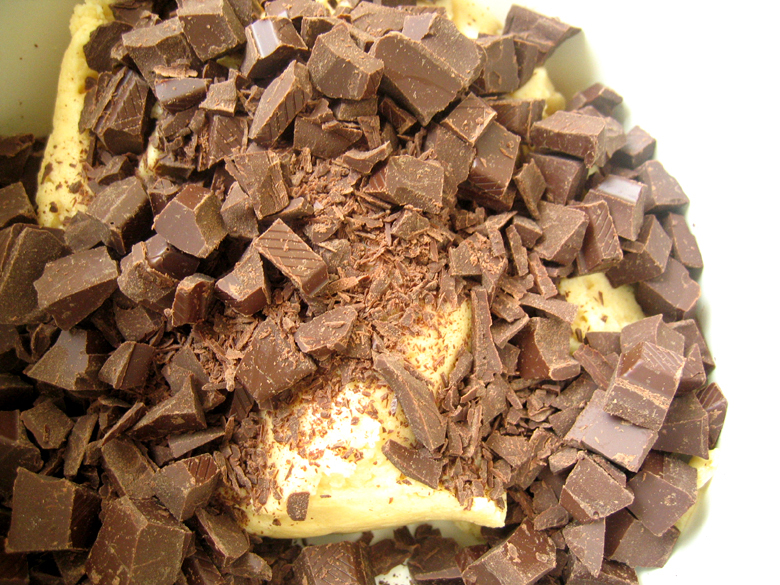 Alot of times, when I bake cookies that call for chocolate chips, I immediately replace them with chocolate chunks. I always have a few bars of Carrefour Dessert Chocolate in my refridgerator because I always have the urge to bake these chocolate chunk cookies whenever I have the time. 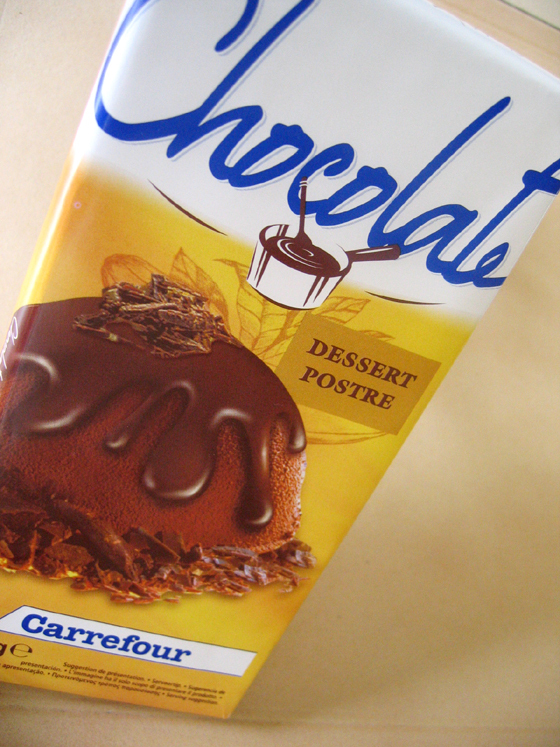 I’ve used Carrefour’s chocolate to make fondue and truffles. They always turn out great and I’ve stuck to the Carrefour brand ever since. I don’t remember when I started using Carrefour’s Dessert Chocolate. I think it was 3 years ago when I started to bake avidly. That was about the time Carrefour came to Singapore. There are currently two outlets here. I love Carrefour because of the French and international products the carry. Alot of times, they have stuff that I find hard to find at NTUC. Usually people scoff at homebrands but truly, Carrefour’s chocolates are a force to be reckoned with. Call me biased if you wish, but I am a firm believer of quality and am not blinded by brands. Yes, it might be cheaper than branded chocolates (SGD$4.90 for two 200g bars) but it suits me fine. I think it gives my cookies that extra omph. That’s how big I chop them chocolates. I don’t believe in scrimping when you bake chocolate chunk cookies. The more chocolate the merrier! Chocolate chips just doesn’t do it for me. I think they are toooo tiny! My cookie dough loves its marriage to Carrefour’s Dessert Chocolate…. In order to get mighty fine chocolate cookies, you need good chocolate and I have found that in Carrefour. Oh what would I do without their chocolates? 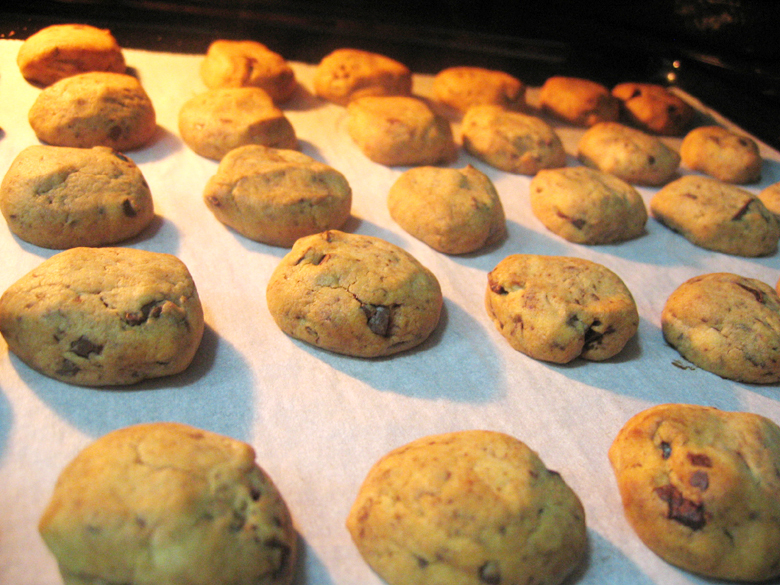 Perhaps then, I wouldn’t have the yummiest chocolate chunk cookies. With good chocolate, you find infinite possibilities. Set your oven temperature to 180 degree celcius. Cream together butter and sugars until smooth. Add egg and vanilla and blend in. Mix the rest of the dry ingredients. Stir in chocolate chunks. 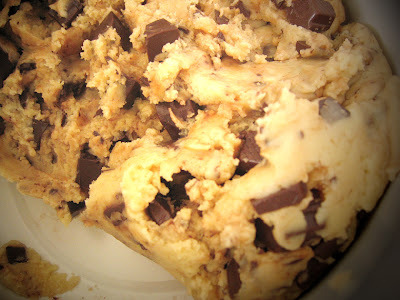 Drop cookie dough onto a greased baking sheet and bake for 8-10 minutes or until golden brown. Oh me oh my… Now THAT’S what I call chocolate chunks!! I would love to try one of those cookies. Great post! Coincidentally, i made chocolate chip cookies infused with mint extract which totally hit the spot at two this morning. I use Phoot Huat’s dark couverture chocolate, which is a real steal at $9ish for a whole kilo. Plus it’s 70ish%, if my memory isn’t failing me. Oh just as a tip, last i was at NTUC, the Nestle melts were going for about $3ish, which is a little more than half the price. I’ll definitely make it a point to pick the Carrefour chocolate up the next time i’m wandering around one of their stores. Thanks for the tip, Cheryl! may i know what kind of cup measurements you used? i am from malaysia, wonder if the cups are the same? cheryl..i have yet to try your cookies! Heh.. 😛 Anyway, fantastic chocolate CHUNK cookies indeed! love it.. craving for one now especially in this stressful moment. Cya..
how do we contact you if we want to purchase the cookies? and you sell them by the box or? please reply soon! the cookies look fantastic i want to buy them! Babe!! U bake the prettiest homemade cookies!! Are they for sale?? I realized u can have the same recipe but everything turns out diff all da time. hey cheryl!!! i’m so sorry i did’t reply you.. actually i have seen you around school (i know i sound like a stalker) but the next time i do, i will go up to you with a huge grin on my face (provided i have no looming project work deadlines).. haha.. don’t be shocked yar? 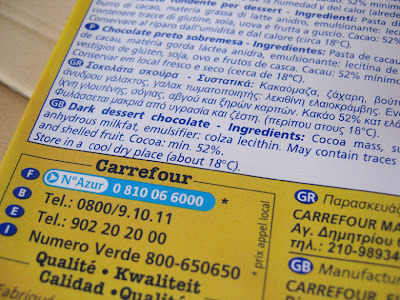 I love the carrefour chocolate myself! Was very wary until philippe recommended it. I’d say it still misses that extra ‘orgasmic’ bit that you get from valrhona, but until people start paying me for my baking I’m sticking to Carrefour 🙂 Have you tried some of the darker versions? Sing Yin @ Serene: thanks! 🙂 hmmm why not bake brownies? or make peppermint ice-cream or something? thecoffeesnob: hey hey, thanks for the tip… the cookies sound good. hmm i’ve never tried baking cookies with mint. i’m sure it’s really yum! Just found your blog and have spent the last hour reading it. I love Carrefour chocolate too, and use it quite regularly when I get home. Great entry! Omg, are they YUMMY! First time I’ve tried out a recipe posted by a food blooger, I’m so glad it turned out so well! they look gorgeous! just right for a chocolate lover!! Anyone can tell me where i can get vanilla extract? I went the shop at Haig road but its sold out. Called Phoon HUat and they don have this product. what type of cookie is this? chewy? or cripy? how many does your recepie yield? May i ask how do you define the amount by using ‘cup’ as the measurement? like how many grams is that? Tried your recipe, and agree it’s on par with famous amos! Could you do a post on the difference between the different types of flour and if they can be used interchangably?